Prohibition in the United States began on January 1920 when the 18th Amendment, ratified the previous year, took effect. It ended with the passing of the 21st Amendment on December 5, 1933, which repealed the 18th. Illegal liquor was, of course, produced and sold during this time. It was typically lousy stuff; poor quality drink made, sometimes, from types of alcohol not intended for human consumption. But Florida was a different story. High quality rum and other spirits were available just a few hundred miles away in the Bahamas and Cuba. The only thing separating thirsty Floridians and these riches were the perilous Florida Straits, but where there's a will, there's a way, or so the saying goes - and so rum-running was invented. 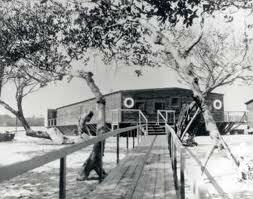 The boundary between the US and international waters was, at the time, only 3 miles off the coast of Florida. Ships would line up in this area - Rum Row - and daring sea captains would retrieve the liquor and make their way back to land. From there, the liquor would be shipped all over the US (by people like Al Capone, who lived in Miami at the time), as well as brought to local Florida speakeasies and private clubs. The Coast Guard had a tough time confiscating the rum and catching the runners because their ships were slower and less maneuverable than the speed boats that transported the Bahamian and Cuban goods from Rum Row back to the shore. Even when the boundary was moved back to 12 miles off the coast the Coast Guard could not keep up with the flow of illegal liquor. Rum Row was a reckless, lawless place, and rum-runners were armed to protect themselves from hijackers. It paid to protect the goods - rum-running captains could make up to several hundred thousand dollars a year. It was typical for rum-runners, in an effort to stretch those profits, to water down their liquor or re-label it so that it appeared to be of higher quality. One piece of lore from this time in Florida's history is that the term "the real McCoy" was coined because famous rum-runner William McCoy did not cut either of these corners but, instead, made it a firm practice to deliver pure, high-quality liquor (although there are many other claims to the expression). McCoy, in his autobiography, entitled The Real McCoy, explains what drew him into this illegal trade. "I went" he says, into rum running "for the cash and I stayed in it for four years for the fun it gave me." In those years he made hundreds of thousands of dollars, and by the time he was arrested he had personally delivered more than 700,000 cases of liquor to the U.S. He wrote, "there was money in the game - lots of it if you could keep it. Beyond that there was all the kick of gambling and the thrill of sport, and besides these, there was open sea and the boom of the wind against full sails, dawn coming out of the ocean, and nights under rocking stars. These caught and held me most of all." Two of the old Florida speakeasies still exist today. 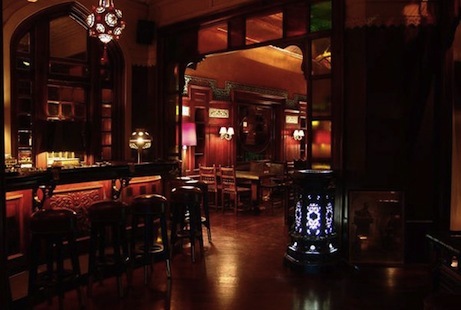 The first, Tobacco Road, Miami's oldest bar, was built in 1912. It is celebrating its 100th birthday on November 11, 2012. The upstairs bar still has the dark and eerie quality it had when it was a speakeasy during those prohibition years. The second, Cap's Place, is a restaurant and speakeasy opened in 1928 by a sea captain named Eugene Theodore "Cap" Knight. It served famous people such as Franklin D. Roosevelt and Winston Churchill and is located on a remote island in Broward County. Watch a trailer for Prohibition and the South Florida Connection, a documentary about rum-running in Florida. This "beyond the book article" relates to Live by Night. It originally ran in October 2012 and has been updated for the May 2013 paperback edition.